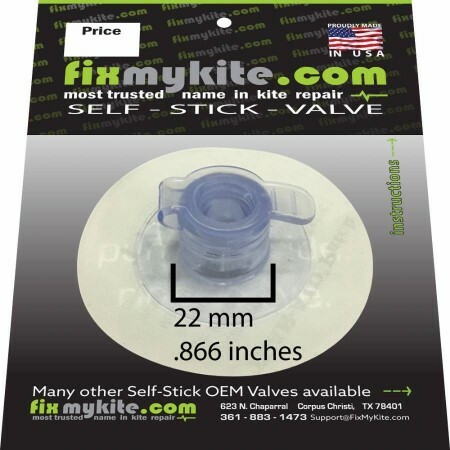 The 11mm Deflate (Dump) Self-Stick-Valve is used on most kites as the deflation system. If your old valve(s) cleanly peel(s) off, a larger Mega patch in most cases isn’t necessary. 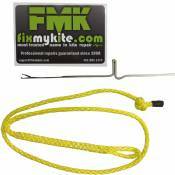 How to install a fixmykite.com self stick valve? 2. Cleaning: Wipe area where valve will be placed with provided alcohol swab. DRY COMPLETELY WITH A CLEAN PAPER TOWEL. 3. Peel and Stick: Lay bladder out flat. If possible, have a friend lightly hold bladder on table or other smooth even surface. Peel off paper backing, center valve over hole, and place valve on bladder. 4. Press: Press valve from center outward to remove air bubbles and ensure proper adhesion and creases. *Pro Tip- Use a hair dryer to heat the valve. This makes it easier to remove the valve. After placement of the Fixmykite self stick valve use the hair dryer again to warm the adhesive. Press the valve from the center out massaging and stretching creating positive adhesion. Be careful not to overheat the bladder or new valve.